Referee Mark Heywood asks Posh midfielder Jermaine Anderson to leave the field. Photo: Joe Dent/theposh.com. Peterborough United have failed in their bid to have Jermaine Anderson’s controversial red card rescinded. 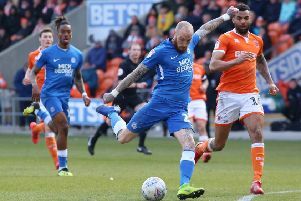 Midfielder Anderson was dismissed six minutes from the end of Saturday’s (September 20) 1-1 League One draw with Walsall at the ABAX Stadium on the advice of fourth official Rob Smith. Fourth official Rob Smith and referee Mark Heywood discuss Anderson's indiscretion. Photo: Joe Dent/theposh.com. Smith, who had struggled to operate the substitutes’ board effectively and appeared to allow substitutes on to the pitch before the departing players had left the field, claimed to have seen Anderson throw a water bottle into the crowd after a drinks break in a violent manner. Referee Mark Heywood, who otherwise enjoyed an excellent game, promptly sent the bemused teenager off, for violent conduct according to caretaker-manager Grant McCann. It was the first red card of Anderson’s career. Both McCann and Anderson claimed the midfielder’s errant throw was an accident. As it landed amid a group of Posh supporters this is most probably true. One of the fans caught in the friendly fire e-mailed Posh chairman Darragh MacAnthony to confirm this and that no offence had been taken. McCann and Anderson both apologised to the fans at the time. Northants FA Chief Executive Kevin Shoemake, a former Posh goalkeeper, was at the game in a media role, saw the incident, and wrote a letter of support on behalf of Anderson. The club were confident common sense would prevail, especially as the Peterborough Telegraph understands the referee’s report claimed Anderson, who made his England Under 20 debut earlier this month, had hurled the bottle over-arm, whereas Posh had video footage showing he had tried to return the bottle to his coaching staff with an underarm throw. But Anderson’s appeal was rejected by the FA on the same day that they over-turned Arsenal defender Gabriel’s red card for his part in a pathetic, childish and over-aggressive tussle with Chelsea trouble-maker Diego Costa. Anderson will now miss the games against Bradford City (away, September 26), Bury (home, September 29) and Millwall (home, October 3). This Saturday Heywood takes charge of League One’s big derby between Sheffield United and Doncaster in front of over 20,000 fans at Bramall Lane. Posh officials have declined to comment on their unsuccessful appeal. Privately the Peterborough Telegraph assumes they are fuming. TV evidence proved what the naked eye thought it had seen and Posh received a letter of apology from the referee’s assessor for the most obvious of errors.